For the Curry Mayonnaise: In the bowl of a food processor fitted with a blade attachment, add egg yolks, water, lemon juice, white vinegar, Dijon mustard, dry mustard powder, and salt and blend until smooth. With the motor running, slowly pour the vegetable oil into the food processor and blend until emulsified. Add curry powder, lime zest and juice, and process until blended thoroughly. Remove the mayonnaise to a large bowl. 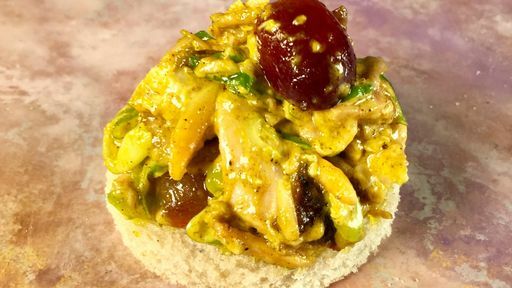 For the Chicken Salad: To the curry mayonnaise, add the grapes, shredded chicken, almonds, and scallions, and stir to combine. Season with salt and pepper to taste. Using a 3-inch biscuit cutter, punch out the center of a multigrain bread slice. Before removing the biscuit cutter, fill the inside with chicken salad. Remove the biscuit cutter and repeat with remaining slices of bread and serve! Tip: For a lighter option, serve a scoop of chicken salad on top of a bed of your favorite greens!